In 101 simulations of Los Angeles vs. Chicago, the most common scenario was a Cubs victory in seven games. There was no shortage of drama in the NLDS, but maybe we’ve seen nothing yet. The Dodgers were able to fend off the Nationals in 5 games in the NLDS thanks to clutch performances from Kenley Jansen and big time Game 5 save from Clayton Kershaw. 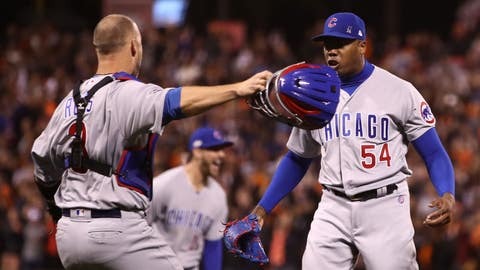 The Cubs fought off the "even year magic" of the Giants and put together an incredible 4-run ninth inning to cap off the comeback and close out the series. Now, these two NL powerhouses will meet for the right to advance to the World Series. According to our projections, it’s the Chicago Cubs who will win this series by the slimmest margins. Our simulations have the Cubs winning 53.5 percent of the time. Interestingly enough, the longer this series goes, the more it favors the Dodgers. The Cubs pulled off a 4-game sweep in 10.9 percent of the simulations compared to just 3.0 percent for the Dodgers. The pitching from both teams in this series is expected to be dominant. The Dodgers hit just .226 as a team throughout the simulations, while the Cubs didn’t fare much better at .241. Leading the way for the Dodgers was Corey Seager (.245, 1.04 HR per game), while Kris Bryant carried the load for the Cubs (.255, 1.22 HR per game). Chicago struggled with two big southpaws for the Dodgers, Kershaw (3.00 ERA) and Rich Hill (2.97 ERA). On the whole, the starters for Los Angeles (3.42 ERA) out-pitched Chicago (3.60 ERA). However, the Cubs had the edge in relief pitching. Chicago’s bullpen combined for a 3.45 ERA, compared to a 4.12 ERA for the Dodgers’ staff. It doesn’t get a whole lot closer than this. If our projections are right, we should be in store for plenty of NLCS drama. Interested in simulating the game yourself? Try MLB SimMatchup. Or, create your own Dream Team of current and historical players to challenge your favorite club.